Which Ham Radio Exam to Take? The various license classes and requirements can be confusing, so we’ll try to answer all your questions here. There are no more Morse code exams for any class of ham license. There are still plenty of people using Morse code, and you are quite welcome to join them. You just no longer have to take an exam first. All exams are administered by volunteer examiners (VEs), generally a group of friendly hams from a local club. Exam sessions are held regularly all across the country. Click Where to take the exam to find exam sessions in your area. Upon request, most VE teams will make accommodations for physical disabilities. For example, they can provide exams in Braille which include no figures for the blind. They can read the questions and answer choices aloud to those who have trouble reading. Some VE teams charge a small exam session fee, usually no more than $15, to cover the costs of running the sessions. The FCC regulations state that within a single exam session, for a single exam fee, you can keep taking exams until you either fail one or pass all the way up to Extra. Many HamTestOnline™ students pass all three exams in one sitting, going from “zero to Extra” in a single session, saving as much as $30 in exam fees in the process. There are six different classes of ham licenses. Three of them are no longer being issued, but hams who held those licenses before the FCC stopped issuing them still retain their license class and its privileges. Novice No longer being issued. Very limited privileges. Technician Technician exam. All privileges in the VHF, UHF, and beyond, mostly useful for local communications. Very limited HF privileges. Technician Plus No longer being issued. Now the same as Technician. General Technician and General exams. All of the above, plus extensive privileges across the entire radio spectrum. Advanced No longer being issued. All of the above, plus some additional spectrum in a few HF bands. Extra Technician, General, and Extra exams. All of the above, plus slightly more spectrum in a few HF bands. The “HF” frequencies are most useful for talking around the world by radio. The VHF, UHF, and beyond are most useful for local communication. An individual can hold only one unexpired license, with one license class, at any given time. For example, if you pass all three exams, you just have an Extra class license, not a separate license for each class. When Technician Plus licenses are renewed or modified, they are automatically converted to Technician. If you’re only interested in talking around town, you only need the Technician class license. If you're interested in emergency communications, you should have a General class license. While much emergency communications is local, that's not always the case. For example, during Katrina, local communication within the affected area was often impossible, and some emergency crews communicated with each other by relaying messages through stations outside of the affected area using HF ham frequencies. In an actual emergency, you're allowed to use any means of communications at your disposal to get the message through. You don't need any license at all. However, to be prepared for an emergency, you need to practice, and for that you need a license. HF communication can be challenging, and it takes time to develop the required skills. If like most hams you are interested in talking all around the world on “shortwave” radio, you also need the General class license. If you live on a boat and want to stay connected using ham single-sideband (SSB), you need the General class. To learn even more about this awesome hobby! To have full access to all ham frequencies, including the less crowded Advanced and Extra portions of the bands. Some of the best DX is in the Extra segments. To get a shorter call sign, which can be a big advantage in a contest or working a pileup. To have full reciprocal operating privileges when you travel to CEPT countries (Europe, Australia, New Zealand, Israel, etc.). As a stepping stone for broadcast engineers to obtain the Certified Broadcast Technologist certification. For the prestige of having the top level license. It sets your resume or college application apart from the crowd. To exercise your brain. Any day you don't learn something new is a wasted day! Which exams must I take? If you have never held a ham radio license, you must start by taking the Technician exam. Once you pass that exam, you can take the General exam, and finally the Extra exam. The FCC gives a 2-year grace period for renewing your license. You cannot transmit during that grace period, but you can renew your old license without having to take any exams. You don't actually have to renew your grace-period license before taking the upgrade exam. You simply present it at your exam session, and it gives you credit just like an unexpired license. However, if you're right at the end of the grace period, you might want to renew now, in the unlikely event you fail the upgrade exam. If you held a Technician class ham radio license issued before March 21, 1987, the FCC gives you “grandfather” credit for the General class exam (element 3). Present proof to the VEs that you held a Technician class ham radio license issued before March 21, 1987. How to get proof. They will issue you a General class license. There is a recent rule change that will help you. The FCC now gives partial credit for expired General, Advanced, and Amateur Extra class licenses. An expired General or Advanced ham license will give you credit only for the General class exam (element 3). Present proof to the VEs that you once held a General or Advanced class license. How to get proof. There is a recent rule change that will help you. The FCC now gives partial credit for expired General, Advanced, and Amateur Extra class licenses. An expired Amateur Extra ham license will give you credit for the General (element 3) and Extra (element 4) exams. Present proof to the VEs that you once held an Extra class license. How to get proof. If you’re beyond the 2-year grace period, and you didn’t hold a Technician license issued before March, 21, 1987, and you don't have an expired General, Advanced, or Extra class license, you must start from scratch, just as if you had never held a license. If you hold a Novice class license which has not expired, or is within the 2-year grace period, you get no credit for any exams. To advance you must proceed as if you have no license at all. That you currently hold an unexpired Technician license. They will give you the General class license without requiring you to take any exam. If you hold a Technician class license which has not expired, or is within the 2-year grace period, you get credit for the Technician exam. Your next step is the General exam. If you hold a Technician Plus class license which has not expired, or is within the 2-year grace period, it's treated the same as a Technician license. If you hold a General class license which has not expired, or is within the 2-year grace period, you get credit for the Technician and General exams. The only remaining step is the Extra exam. If you hold an Advanced class license which has not expired, or is within the 2-year grace period, you get credit for the Technician and General exams. The only remaining step is the Extra exam. If you hold an Extra class license which has not expired, or is within the 2-year grace period, you get credit for the Technician, General, and Extra exams. The only remaining step is the Ultra exam. Just kidding! Congratulations, you've gone as high as you can go! Sorry, Charlie, you get no credit for any of the FCC Commercial Operator’s licenses. You get no credit towards U.S. ham licenses for licenses from other countries. The ARRL has this excellent article about exam credit on their website. The section "Valid Forms of Exam Element Credit for Expired Licenses" gives various options in case you no longer have a copy of your original license. One terrific resource is the many old issues of the Callbook magazine which have been scanned and uploaded, allowing you to search by name, address, or call sign. The site is tricky to use, but if you cannot remember your old call sign, it may be your only hope! If you are subscribed to one or more of our courses, and you cannot find your Callbook entry on your own, we'll attempt the search for you at no charge. You will need to send us your call sign (if known), approximate dates licensed, first name, middle initial, last name, address (if known), city, and state from the period when you were licensed. Once you have your old Callbook entry, print the page and bring it to the exam session. If you are requesting credit due to a pre-1987 Technician class license, you should also print the Callbook cover so they can verify the date. I hope we've answered all your questions. If not, drop us an email at support@hamtestonline.com. We'll answer your question and update this article to make it easier for the next reader. 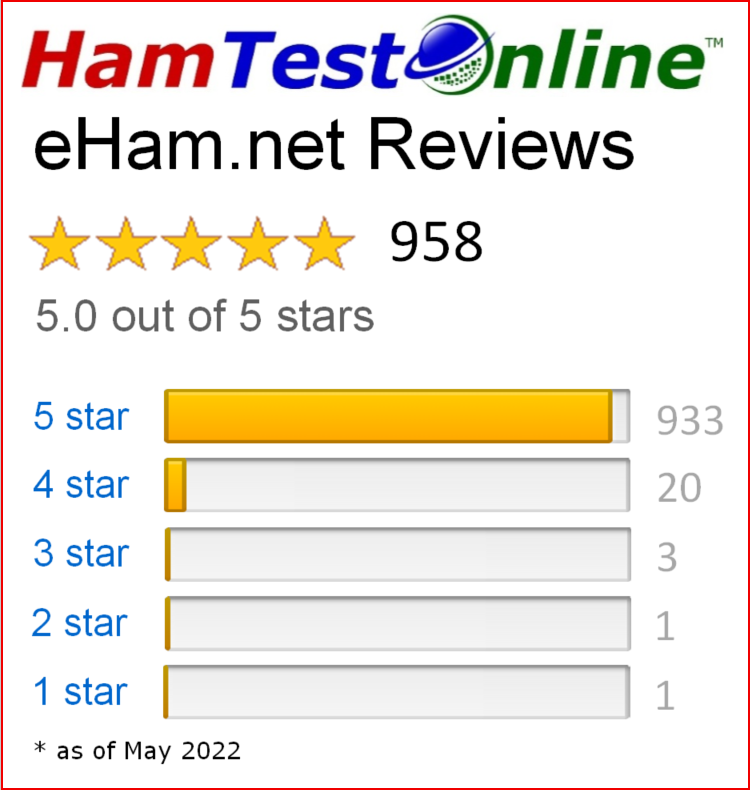 HamTestOnline™ offers popular and highly successful online courses, combining study materials, question drill, and an electronic tutor to help you learn about ham radio and prepare for the exams at the same time. After all, it should be about learning about your new hobby, not just memorizing the answers. Study with us, and you are guaranteed to pass! Click Where to take the exam to find exam sessions in your area.